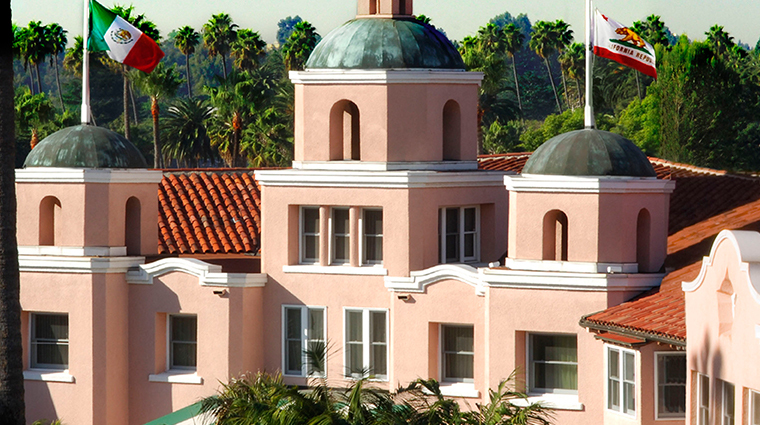 One of L.A.’s most enduring icons is this stately, pale-pink Five-Star hotel on Sunset Boulevard. 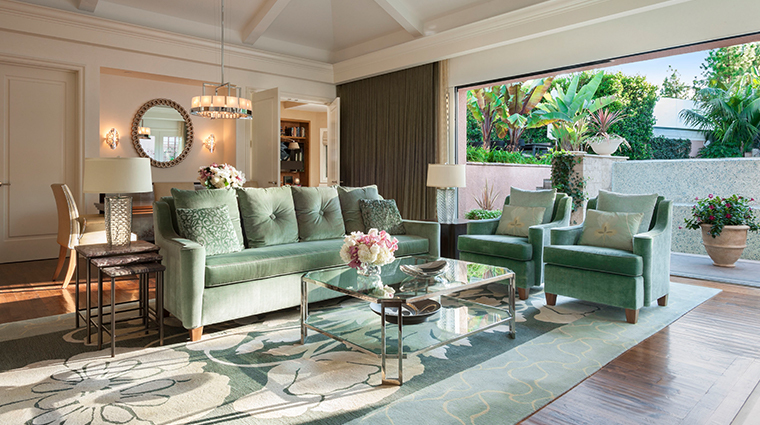 The Beverly Hills Hotel has been attracting guests (famous and not) since 1912, and its star power is by no means fading. 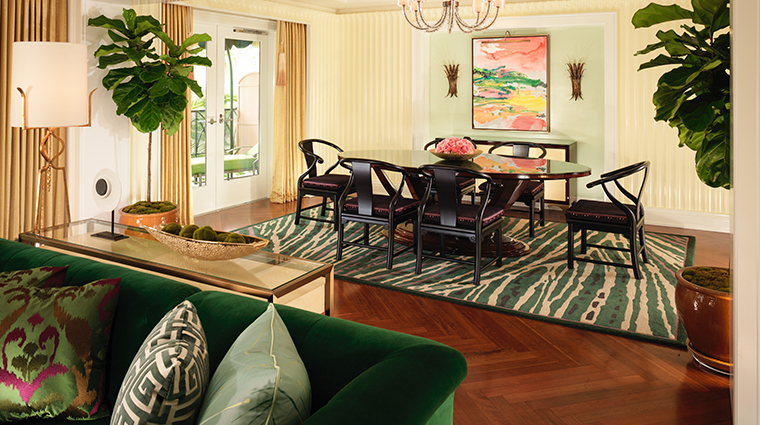 While celebrities love the hotel for its luscious private bungalows (perfect for canoodling and doing whatever else stars do), the rest of us love the tropical gardens (gorgeous) and the retro-style pool (so movie-star chic). 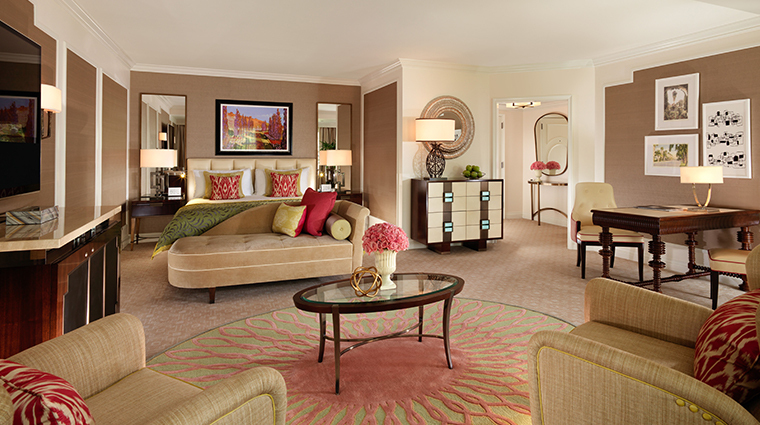 Guestrooms, which are bathed in soft hues, are kitted out in unique English furniture and marble baths. Once you’ve fully reveled in your good fortune (and the impeccable service and extra-comfy beds), make your way downstairs to the French-colonial-inspired outdoor deck. Don’t miss the scene at the famous Polo Lounge, which still buzzes with handshakes and business deals, or the new Bar Nineteen12, which has turned into a place to party with the beautiful and affluent. 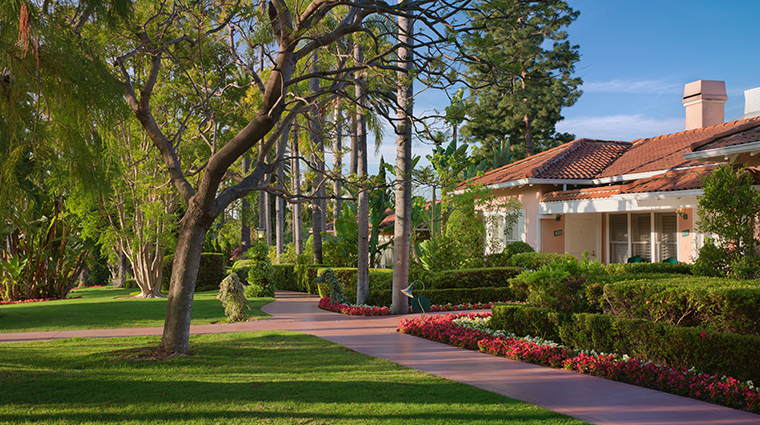 The Beverly Hills Hotel is in the nation’s most famous zip code: 90210. 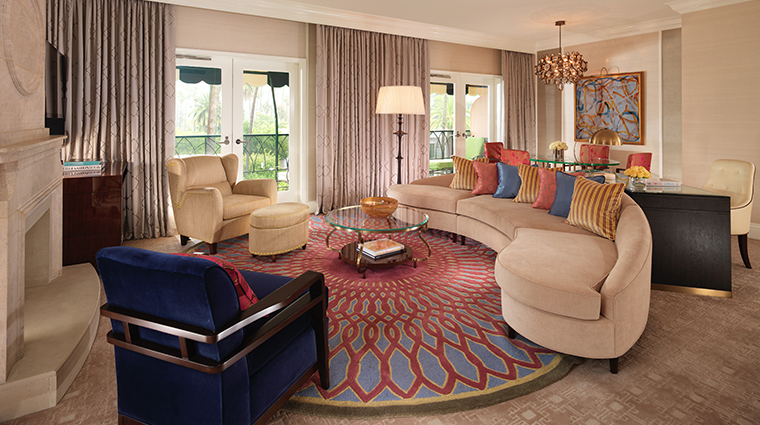 The hotel has played host to countless celebrities over the years, from Howard Hughes to Marilyn Monroe. The “Pink Palace” — as it’s known for its striking pink interior and exterior — is situated at the epicenter of Beverly Hills near three of the city’s most famous streets: Rodeo Drive, Sunset Boulevard and Beverly Drive. The world-famous pool area is effortlessly chic, surrounded by lush palm trees, crisp white umbrellas and private cabanas. Ask for a personal sunshade, chilled towel or cocktail made with housemade sorbet and you'll feel like you've escaped to a tropical paradise. Ride in style with the complimentary house car — a Mercedes 400 hybrid sedan — which will take you anywhere within a three-mile radius of the hotel. 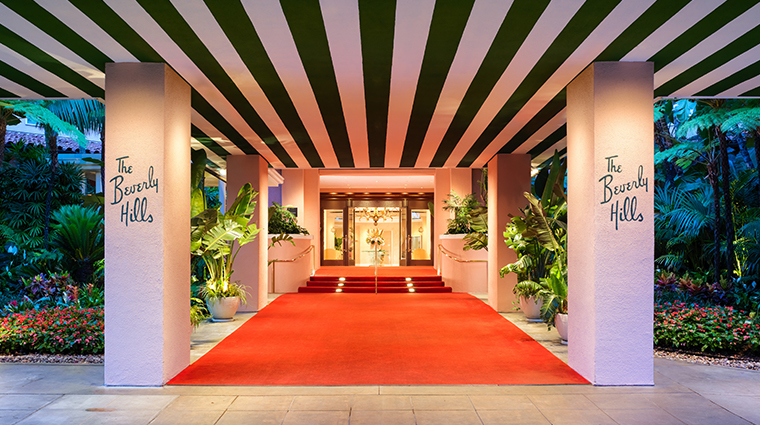 You’ll definitely feel like everyone is awaiting the entrance of a Hollywood A-lister off the red carpet. 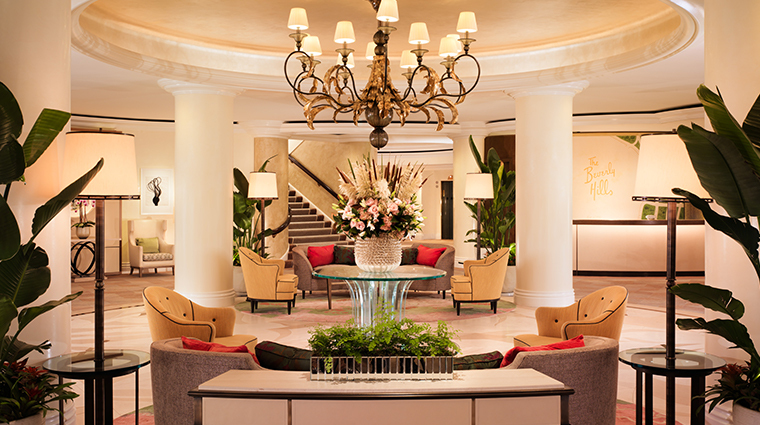 The hotel oozes Old Hollywood charm thanks to its long-standing history. 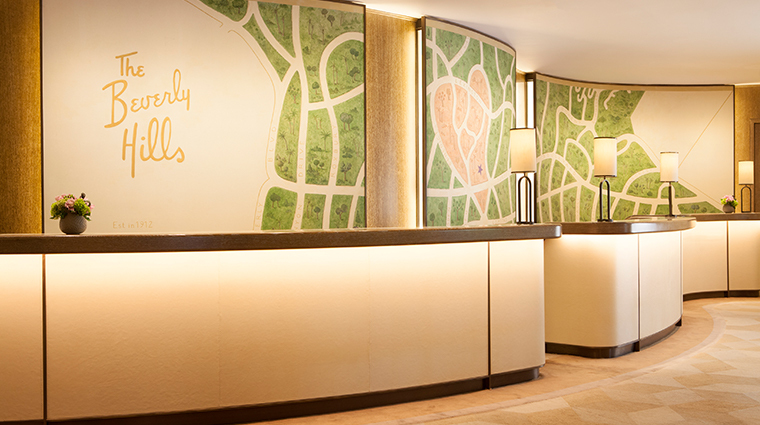 Even if you're not a celebrity, you'll get the red-carpet welcome — the hotel's entrance is outfitted with a giant red carpet leading up to the friendly, cheerful lobby. 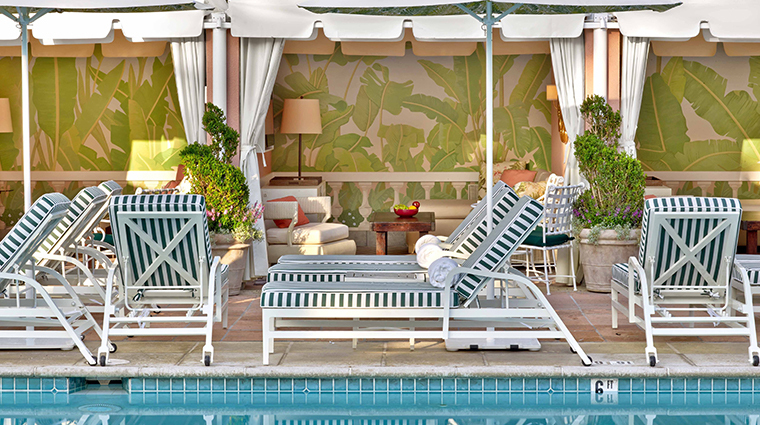 The Beverly Hills Hotel has a world-famous pool and a full-service spa that features luxurious treatments using diamond crystals and caviar to smooth your skin. Book a treatment in a private cabana overlooking the pool or sit back and relax in a green and white lounge chair with your own personal sunshade. Cocktails by the pool are cold and delicious. Try one of the icy specialty margaritas made with reposado tequila and flavors such as spiced pineapple and guava. 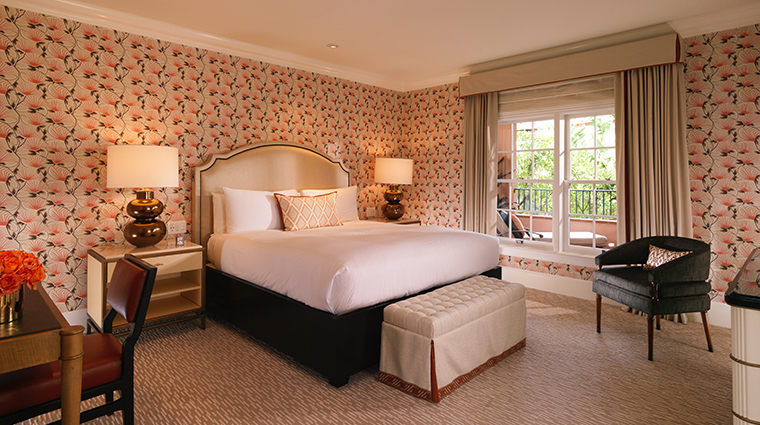 The rooms at The Beverly Hills Hotel are spacious and airy, with comfy beds, large bathrooms and décor that makes you feel right at home. 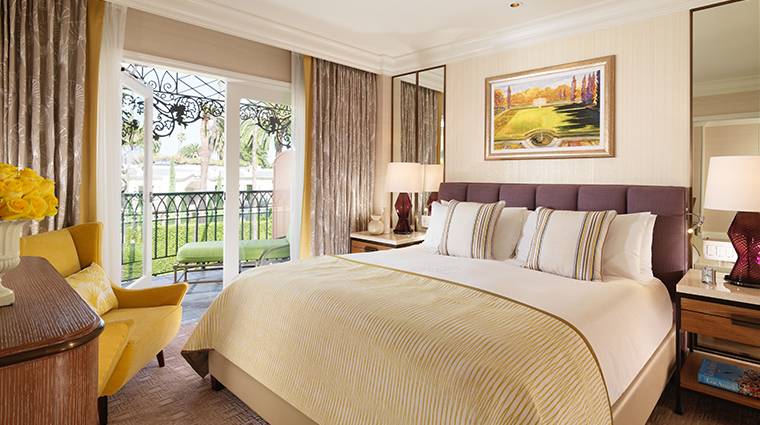 There’s a nice-sized foyer that leads to a large area with a separate nook under a cut-out archway for your king-sized bed, which is topped with fluffy pillows and monogrammed Beverly Hills Hotel sheets. 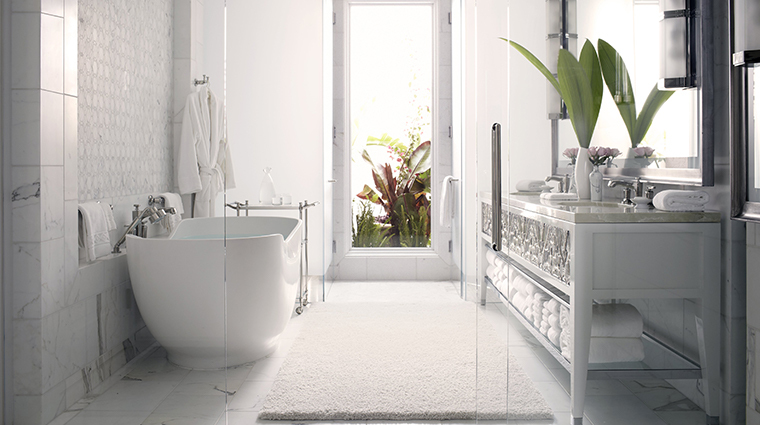 Natura bath amenities are also made exclusively for the iconic Forbes Travel Guide Five-Star hotel. After bathing in the deep soaking tub with Natura bath salts, you can read your choice of four daily newspapers while you grab a snack from the gourmet mini-bar. You’ll find a large armoire, a DVD player and a 42-inch Philips flat-screen TV, plus a mini-bar stocked with goodies such as chocolate-covered blueberries, gummy bears and pistachios. 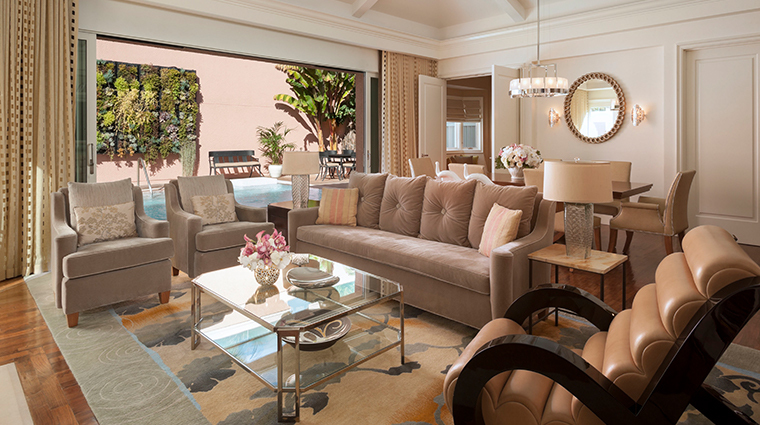 We highly recommend snagging a guest room on the first floor, with French doors that lead out to a private courtyard with a table, chairs and a sun lounger. 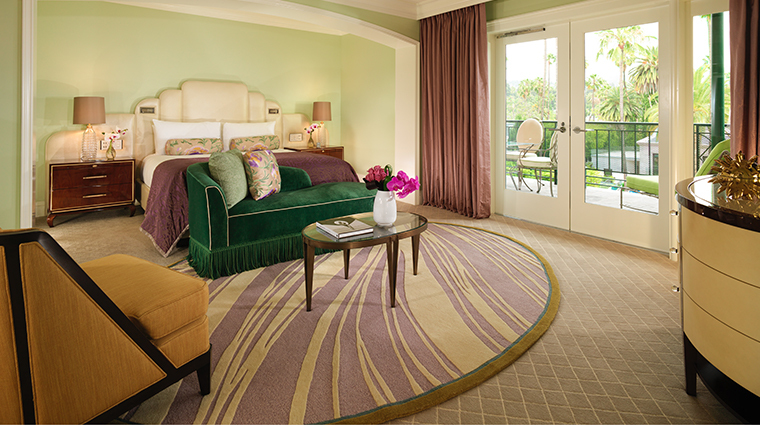 You’ll feel at peace surrounded by lush palm trees, banana plants and creeping vines with bright budding flowers. In the morning, head to the Fountain Coffee Room, a cozy breakfast joint with 1950s-style counter service and a soda fountain. There’s just one cook and it’s first-come, first-served, so be sure to get here early. 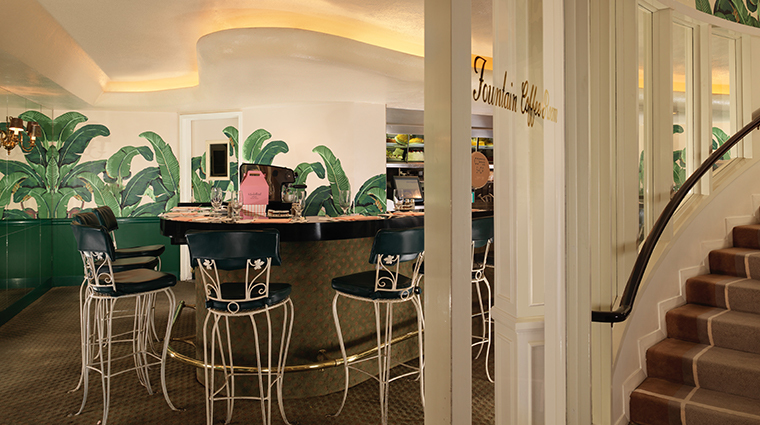 Saddle up to one of the restaurant’s original green bar stools and order up treats such as pancakes, waffles, French toast and decadent omelets filled with rich ingredients like caviar and sour cream. 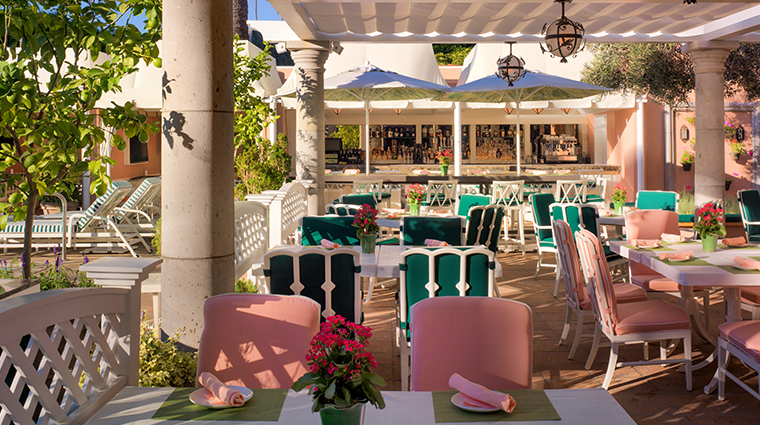 Enjoy relaxed poolside dining at the Cabana Café from 9 a.m. to 6 p.m. The outdoor café serves breakfast, lunch and dinner with casual fare like fresh fruit smoothies, sandwiches, salads and burgers. Try the Beverly, made with champagne, strawberries, basil, lemonade and housemade lemon sorbet. 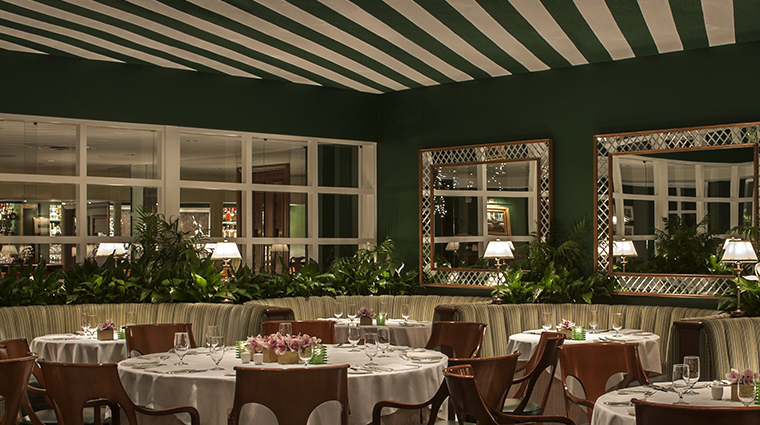 Hollywood’s elite know The Polo Lounge is the place to go for breakfast, lunch, afternoon tea and dinner inside on the comfy green banquettes and outside in a courtyard filled with lush banana plants and flowers. 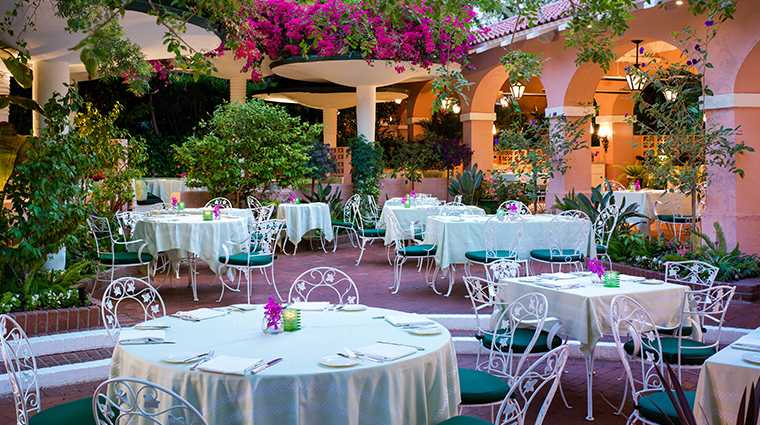 Lunch and dinner are accompanied by live piano jazz, which plays into the evening on long summer nights. 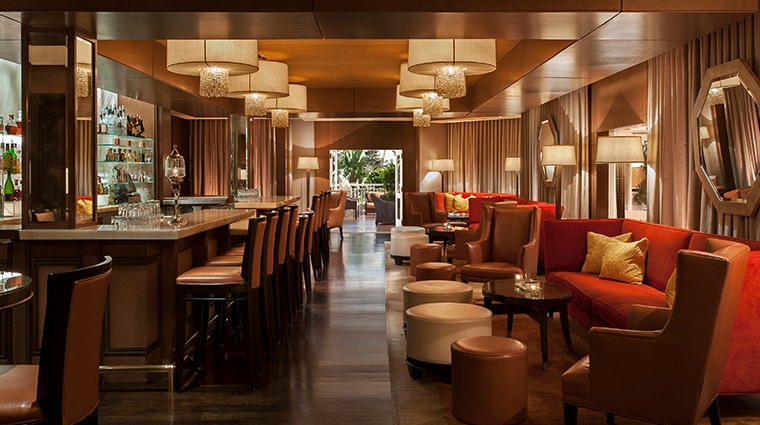 Bar Nineteen12 — aptly named for the year the hotel opened — serves signature cocktails and light fare in the elegant indoor bar, or outside on the terrace overlooking the pool and gardens — the perfect spot to catch a Beverly Hills sunset.